To produce sound historical research, we need reliable primary sources. Records created at the same time as an event, or as close as possible to it, usually have a greater chance of being accurate than records created years later, especially by someone without firsthand knowledge of the event. When you are conducting research, you want to corroborate the contents of the document you are working with with information from other sources that have been proven to be legitimate. 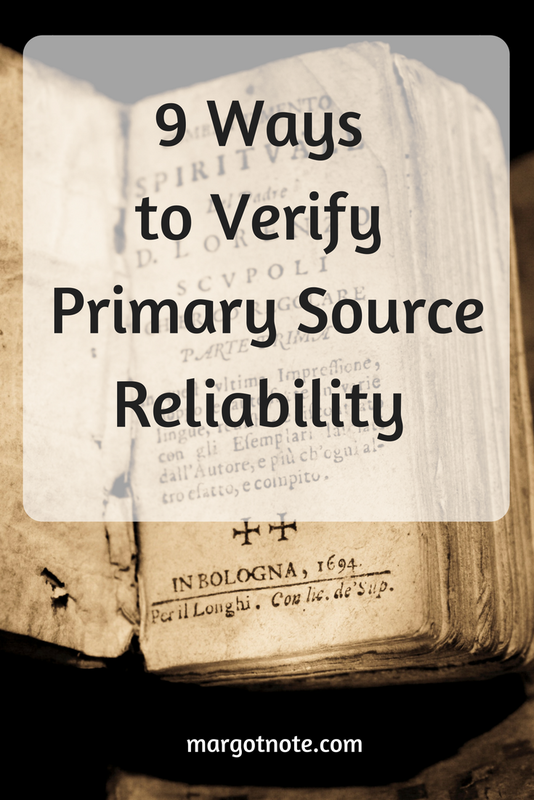 While this post concerns written sources, one must remember that these questions can also be posed to other types of primary sources. I always advise my students to consider non-textual sources. For example, photographs have captured information about groups of people that the traditional archival record has not. (The development of visual literacy poses its own challenges, which I may explore in future posts). Interrogate the sources you use. Consider two aspects of reliability. One is the record itself. The other is that each source contains individual pieces of evidence to be considered as well. You may not be able to answer all the questions below. However, by what you can answer, you may be able to determine whether you can accept the information as truthful. Was the source created at the same time of the event it describes? If not, who made the record, when, and why? Who furnished the information? Was the informant in a position to give correct facts? Was the informant a participant in the original event? Was the informant using secondhand information? Would the informant have benefited from giving incorrect or incomplete answers? Is the information in the record such as names, dates, places, events, and relationships logical? Does it make sense in the context of time, place, and the people being researched? Does more than one reliable source give the same information? What other evidence supports the information in the source? Does the source contain discrepancies? Were these errors of the creator of the document or the informant? Have you found any reliable evidence that contradicts or conflicts with what you already know? Is the source an original or a copy? If it’s a copy, can you get a version closer to the original? Does the document have characteristics that may affect is readability? Consider smears, tears, missing words, faded ink, hard-to-read handwriting, too dark microfilm, and bad reproduction. In a world of “fake news,” we all have to be mindful about the information we consume. Historical records are no different. Some sources may be considered more reliable than others, but every source is biased in some way. Because of this, historians read skeptically and cross-check sources against other evidence. Being a critical thinker who analyzes primary sources creates quality scholarship and a more accurate historical record. Like this post? Never miss an update when you sign up for my newsletter. As a gift to you, you'll receive a free, premium download of my Project Prioritizer. This trusted tool will help you embrace where you are with your collections and start enjoying your family archives more today.